Australia’s Karen Jacobsen, The GPS Girl® is no stranger to telling people where to go and what to do. Perhaps her voice guides you every day in the GPS in your car. 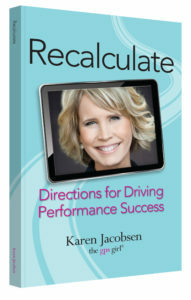 In her new book RECALCULATE – Directions for Driving Performance Success she gives directions of a different kind; for us to be able to perform at the highest level in our field, without sacrificing every other area of life. Mackay born and now New York based, Karen travels the world as a speaker and concert performer. She works with people and organizations who are navigating change and want to be able to Recalculate in business and life. is filled with tools she uses on a daily basis as a mother, wife, business owner, international speaker, concert performer and the voice in over 400 million GPS and smartphone devices around the world; to keep herself on track, especially when things do not go as planned. – and this book covers them all. After the USA launch Karen visits Australia in June & July of 2016 for events and the Aussie release of her new book. Karen Jacobsen is The GPS Girl®, giving directions as the speaking voice of “Australian Karen” in over 400 million GPS and smartphone devices around the world. A professional speaker, singer and voice-over artist, Karen travels the world speaking and performing concert-style keynotes to groups who want to be able to Recalculate and give their best in business and life. Karen has enjoyed wide media coverage, but she was told she had really made it when she was a clue in The New York Times crossword puzzle. Sharing the bill with Norah Jones, Neil Sedaka and Christopher Cross, she has performed national anthems at many major sporting events including the New York Jets game at Giants Stadium. Karen Jacobsen is the Immediate Past President of the National Speakers Association-New York City, and with an eight year old son has plenty of opportunity to Recalculate on a daily basis. 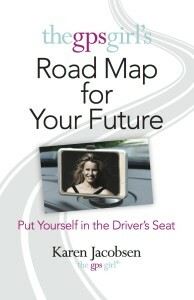 Published by Kurly Queen Publishing “The GPS Girl’s Road Map for Your Future” shows how to move from the passenger seat to the Driver’s Seat, to learn to listen to your Inner GPS and to Recalculate at any time in life just as we do when driving. inspiration for creating the destination of your dreams. Designed to give more focus on a daily basis, increased confidence in decision making and to leave the reader feeling invigorated by having a road map for their future, The GPS Girl points us all in the right direction with her first book. The GPS Girl, Karen Jacobsen’s speaking voice is in over 100 million GPS devices giving drivers directions worldwide as “Australian Karen”. A recent TEDx Speaker, she has appeared on ABC World News Tonight, the CBS Early Show, in The New York Times, NY Daily News, Glamour magazine and was named one of People Magazine’s Most Intriguing People in 2010.